Mastered a live version of #Switchfoot performing "Red Eyes" to benefit #Haiti relief. It's an important time to continue the support. Editing an interview of @jonathanforeman of @switchfoot. He singing a couple songs too. It's like my own private concert. He got talent! LOBH: He is. He's a machine. Along those lines, here's a question from MJ: "What are the Switchfoot guys like behind the scenes, personality wise?" Devin: Extremely genuine. They're always ready for a good conversation. Drew is definitely the sarcastic joker of the band. Jon, Tim and Chad are all huge fans of all things San Diego. We were watching the Chargers game and they were going nuts. They really seem to like surfing too. Mostly though, they're just the kind of guys you would actually want to get to know. Not just hang out with but really get to know. LOBH: What were the reactions when the chargers lost? Devin: Defeat. Pure defeat. They were very disappointed. But, they went on to play a great show anyway. On to tourrr! Switchfoot played Chicago last night, and from the looks of things, they rocked the house, as usual! And, to take a step back in time, here are some illustrious videos from the Pageant in St. Louis, a couple nights ago now. As you all know, "Mess of Me" debuted at No. 2 on the FUSE TV No. 1 Countdown Viewer's Choice yesterday! GREAT GREAT JOB everyone! Take some time to continue to vote for it this week. We can totally get it to No. 1 next week! Comment below, and let us know what you do to make your voting experience a little less dull. 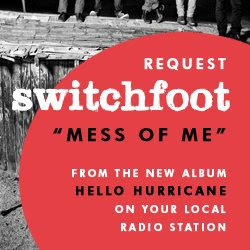 Request "Mess of Me" to be played on Q101 in Chicago. Please also go here to see a list of stations already playing "Mess of Me" and phone numbers to call in and request the song with! Your calls are INSANELY IMPORTANT! HERE are some request links you can do online if you can't reach a phone. Please be SURE to fill out a few of these links every day, especially the ones at or near your area! It is our collective efforts that will ensure the success of this and any future Switchfoot single. All the station links posted below are guaranteed to have played the song at least once.